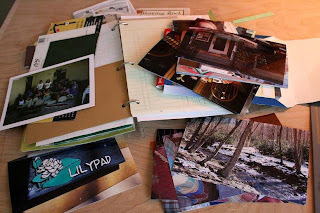 The Creative Place: Hello, Friday! We have returned from our mini-getaway- we had a fabulous trip, and Jimmy had fun with his "Mimi and Dahdaw". It's good to be home and get back into our routine after a refreshing and relaxing trip! I got pictures developed and will be finishing up the mini album of the trip this weekend, so look for that early next week! As we approach Easter Sunday (as well as Good Friday, today), I was meditating on the meaning of Easter and was thinking about all the things I am so thankful for. I decided to make a list that has 25 blanks to fill up with my "thankfuls" today and the rest of this weekend. Weekender: Take a minute to think about the things you are thankful for this weekend, like family, nicer weather, etc. as well as the "little things." Make a "list" - it can be handwritten, or typed out and glued to a piece of decorative paper. Keep it in a place that you pass by often (kitchen, office, bedroom, etc.). 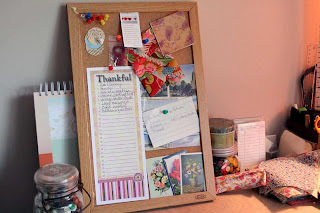 I put my "list" on my bulletin board in my work/craft space so I can add in my "thankfuls" throughout the day. For me, one of those "little" things was something as simple as an "Eggo Waffle" -- hearing my son say he wants a "Fahful" every morning warms my heart. You can download a printable pdf file of my "Thankful Lists" here.